Sheltered from the Atlantic Ocean on a stunning bay in the western tip of metropolitan France, the city of Brest has at its heart one of the country's most animated harbors. With its proximity to the British Isles, this area of France is steeped in Celtic heritage. As such, accordions are eschewed for bagpipes and the locals display a preference for zesty ciders over fine wines. The region even has its own Celtic language, "Breton", which is still spoken by nearly 200,000 people. Brest was sadly all but destroyed in the "Battle of Brest" during World War II. It has since been completely rebuilt and is now a sophisticated city that hosts some of Europe's most theatrical sailing festivals. Every four years, more than 2,000 traditional boats sail from countries as far flung as Madagascar and Mexico to take part in the event, which is attended by nearly 700,000 avid spectators. This year marks its 20th anniversary and, according to the festival organizers, it will be "the biggest and most spectacular event yet." From July 13, Brest will be transformed into five "villages," representing this year's five honorary countries: Mexico, Norway, Indonesia, Morocco and Russia -- all of whom are sending a minor flotilla of historical boats. From village to village, visitors will be able to learn about each country's maritime heritage and sample its music, food and handicraft. "There is no other festival quite like it if you like classic boats," said Adam Purser, who has sailed from England to Brest three times since 2000. "Everywhere you look there are tall ships and the atmosphere is fantastic. There is good food and music and you get to race your ships along a beautiful coastline. I wouldn't miss it for the world," he said. But it's not just an event for maritime history buffs, this year the festival is also welcoming modern boats. Racing enthusiasts will be able to see the finish of the New York to Brest multi-hull transatlantic "Krys Ocean Race", featuring some of the world's fastest trimarans. "The festival has something for everyone. It's really becoming a universal exhibition of all types of boats," said Chantal Guillerm, the festival's director of communications. where les Tonnerres de Brest 2012 maritime festival opened Friday July 13th. Those who can't make it to the summer's main maritime festival can still experience Brest's unique harbor each Thursday during the summer months when it is transformed into a vibrant arts space, packed with live street theater, concerts, comedy and markets. The music on offer is as eclectic as it is exciting, with a mixture of folk, rock, French chanson, world music, jazz, and classical acts taking the stage throughout the summer. In recent years France has produced some of the world's finest electronic bands and Brest has played an integral part in the scene's development. Every summer for nearly 20 years the city has hosted one of the most anticipated electronic music festivals in the country -- "Astropolis" -- a three-day musical feast that takes place in August each year. But there are also plenty of things to do and see outside the summer festival season -- especially if sailing, seafood and marine life are high on your agenda. For years Brest has been the European capital of oceanography. According to the University of Brest, more than 60% of France's maritime researchers and engineers have made the city their home, so it's perhaps no surprise that a giant marine pavilion has emerged there. For those who want to find out more about what species may be hiding under their boat, a trip to one of Europe's biggest marine pavilions is a must. The venue is much more than your average city aquarium; it is an ocean discovery park covering nearly 10,000 square meters, with 50 individual aquariums housing in excess of 1,000 animal species. Through three pavilions dedicated to polar, tropical and temperate marine ecosystems, "Oceanopolis" aims to immerse visitors in an underwater universe representing flora and fauna of oceans around the world. There is also a fourth pavilion that houses the temporary exhibitions on marine biodiversity. The current exhibit, titled "The Abyss," is dedicated to the weird and wonderful creatures that hide in the deepest part of our oceans. Brest was more or less destroyed in the "Battle of Brest" during World War II, but it has since been completely rebuilt. Once owned by King Richard II of England, the impressive medieval fortress is the city's most important landmark that, by sheer fortune, was spared from destruction during the heavy bombing of World War II. The castle and its ramparts offer stunning views of the city and inside the fortress hides the city's branch of the "Naval Museum of Paris," which retraces 17 centuries of Brest's longstanding naval history. Built on an enormous block of granite, the "Tanguy Tower" is a sightseer's favorite, with its medieval turret offering views of the long-winding Penfield river cutting right through the city. The tower is also home to the Brest Museum - where a series of huge dioramas take visitors on a picture journey through the city's origins and development, showcasing life in Brest before it was bombed. There is no road to the White Sea Biological Station, which sits at latitude 66° N on the cusp of the Arctic Circle. Located on the shores of its namesake, the White Sea, the only way to get there is by boat in summer and snowmobile in winter since the waters of Kandalaksha Bay are frozen six months out of the year. Inside the station is an unlikely photo studio where Alexander Semenov, 25, is sharing his stunning photographs of arctic sea creatures with the global online community. “I’m trying to act like the Discovery channel, but as a single unit,” says Semenov. A marine biologist, photographer and head of the WSBS deep-sea diving team, Semenov has been stationed at the WSBS since 2007. Over the years he’s developed a worldwide audience for his photography using Behance, Flickr and his personal blog and website. 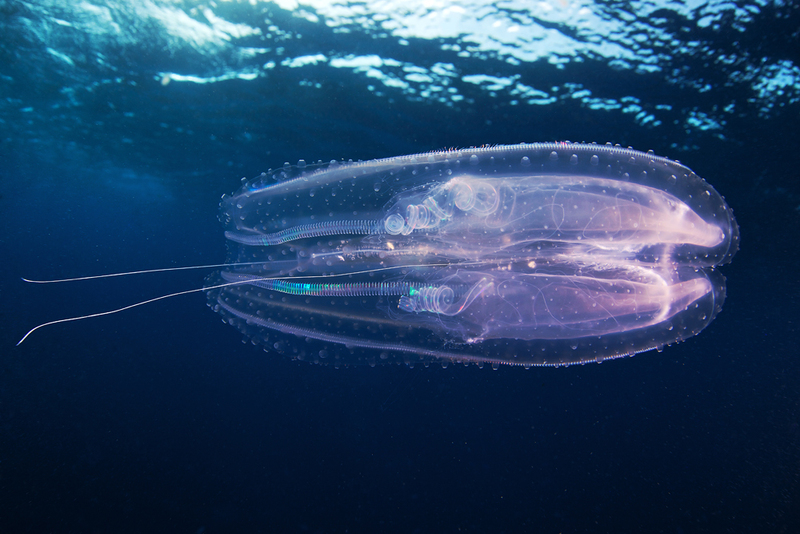 “I think all the people in the world know how tigers and lions looks like, but only a few ever know about scyphozoan jellies – that they can grow up to 3 meters in diameter and have tentacles of 36 meters,” says Semenov. 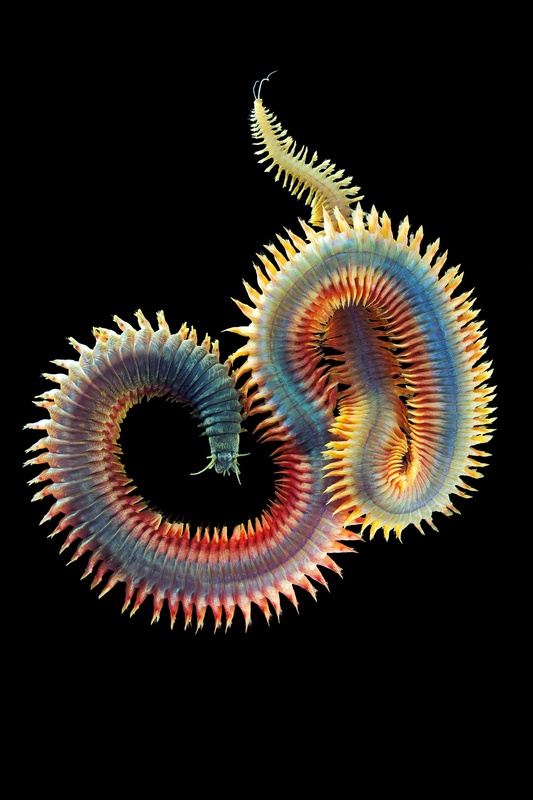 Semenov’s first ventures into deep-sea photography were merely experiments. He spent his first summer at the research center, operated by the Biology Department of Lomonosovs Moscow State University, photographing invertebrates in the laboratory without any professional equipment. With an entry-level camera, low-light conditions and shaking tripod, Semenov was only able to make a few shots he describes as “not so bad” that he shared with his enthusiastic crew. Soon after, the official WSBS underwater camera sunk – a loss Semenov actually considers a stroke of luck. He focused on biology at gymnasium (the high school equivalent in Russia) and went on to specialize in marine invertebrates and squid brains at Lomonosovs Moscow State University. At age 19 and in his third year of University, he had his first underwater dive and his passion for deep sea science was fixed. 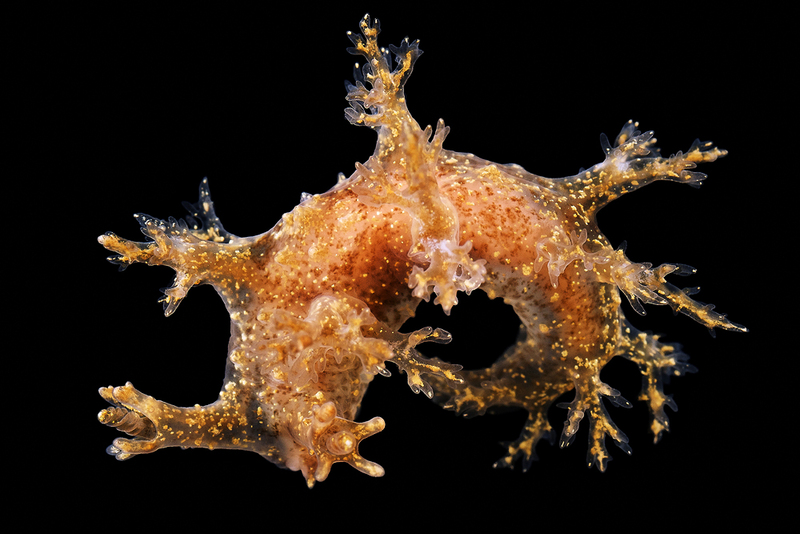 Semenov’s photographs have been used by scientists, teachers, book authors and encyclopedia editors around the world. His team has identified species that were previously unknown to inhabit the waters of the White Sea, but he says it is rare that his team discovers a new species entirely. “The important thing is not to find new species but to understand how every creature you already know lives,” says Semenov. Gearheads will approve of his equipment: He uses a Canon 5DM2 body with a Canon 100mm/f2.8L macro lens in Subal housing with Inon Z-240 strobes, but for Semenov, the photos are more about the experiences behind them. 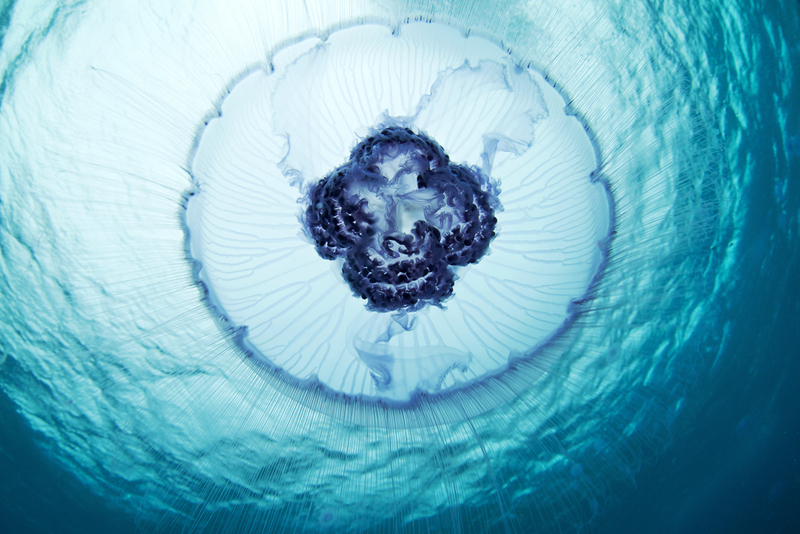 “Nobody knows what you feel on the other side of the camera,” says Semenov, who considers his photographs of a sea angel his biggest triumph (Clione limacina, seen on slide 3 in the gallery above). 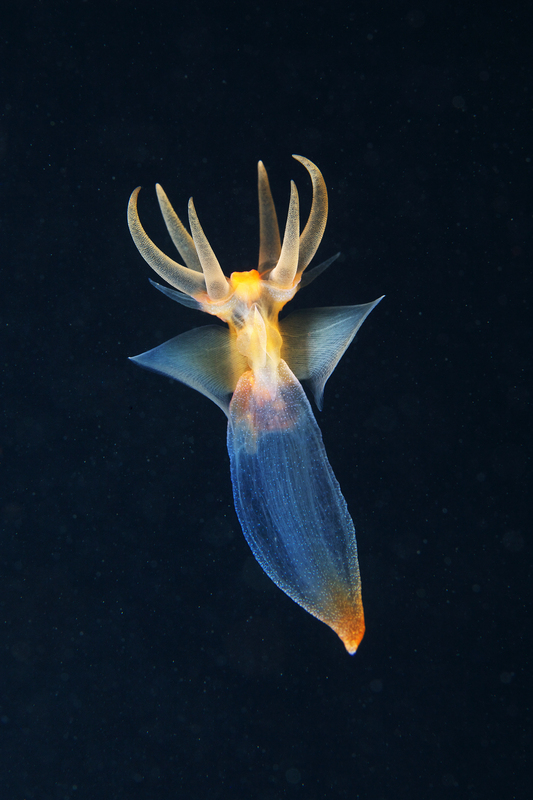 “The sea angel is a planktonic pteropod mollusk, that lost its shell in the evolution process and became a swimmer,” explains Semenov. “All this process in the hunt lasts only for seconds, and sea angels swim at a crazy speed, but I shot it. 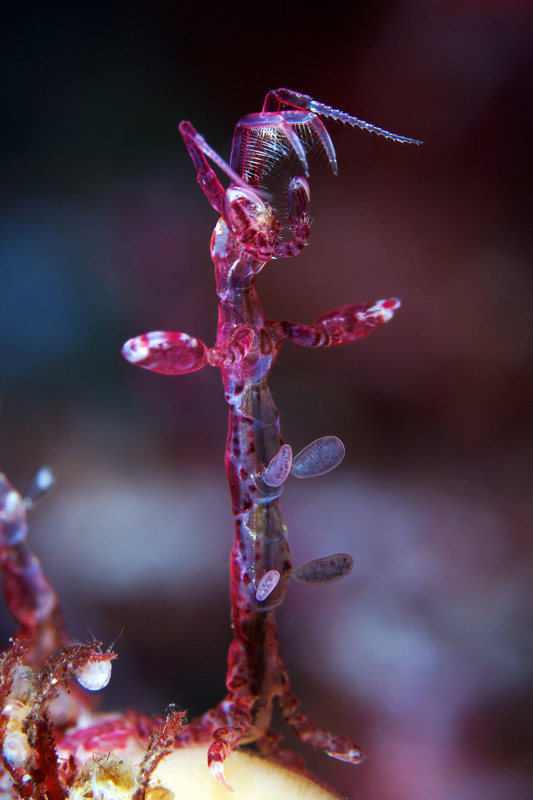 Technically, I think it’s my most amazing photo,” adds Semenov. With only 40 to 60 minutes underwater on any given dive, Semenov also makes many photos in the laboratory where he uses a Canon 8-15mm fisheye, 16-35mm/f2.8L II and a Canon MP-E.
“In the laboratory you have unlimited time and hot tea, so it’s much more comfortable to work,” Semenov stresses. But Semenov is not satisfied with his output just yet. He’s looking for more modern equipment to ramp up the resolution on his images. While marine biology fans are used to alien-looking creatures from the deep sea, Semenov usually dives no deeper than 40 meters. Even so, he says it’s unlikely he’ll ever run out of compelling subjects. 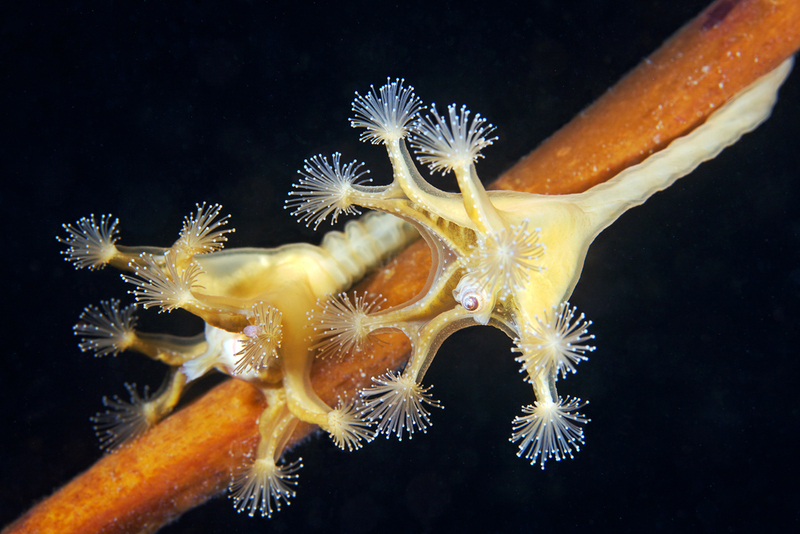 “There are so many animals within the 40m water layer, that I could spend all my life exploring it and maybe I’d photograph 5 percent of the present biodiversity,” says Semenov. A new time-lapse video reveals the view from space during an ambitious U.S. Army project to rebuild an eroding island on the U.S. East Coast. The new NASA video uses satellite views to chronicle more than a decade of work by the Army Corps of Engineers to restore lost portions of Maryland's Poplar Island in Chesapeake Bay about 30 miles (48 kilometers) south of Baltimore Harbor. In the video, images from the Earth-observing satellite Landsat show the island grow from little more than a speck in the Chesapeake Bay in 1997 back into a full-blown island by 2011. "In these Landsat images, the dikes that contain the mud and hold it in place begin appearing in 1998," officials with NASA's Goddard Space Flight Center wrote in a video description last week. "This growing island is a wildlife sanctuary, a hatchery for hundreds of diamondback terrapins and home to about 170 different species of birds including terns and bald eagles." The Goddard space center is located in Greenbelt, Md. Center officials posted the video of Poplar Island from space on June 29, christening it "Mud Island." Poplar Island was originally a single landmass in Chesapeake Bay until the early 1900s, when erosion split the island into three pieces, according to the Army Corps of Engineers. By 1990, the total area of the largest section was less than 10 acres, the corps explains in a project history. A 1994 study found that rebuilding the island to restore more than 1,000 acres would be a good use of sea mud dredged up from navigation waterways leading to Baltimore Harbor, Army officials said. The project began in 1998 and will be complete by 2027. The Television Treatment for Sailing: The America's Cup is employing a series of ambitious augmented reality graphics to explain pro sailing to the television audience. Weighing in at 32.4 pounds, the America's Cup trophy arrives at events carried by two men in navy blazers and white gloves. The sterling-silver ewer, made by the London jeweler Garrard, is nearly 4 feet tall, decorated with flying scrolls, and engraved with details from each race since 1851. Let's be honest: It doesn't smack of egalitarianism. Fifteen years ago an irate New Zealander significantly changed the cup's appearance with a sledgehammer, and it was repaired. So the oldest trophy in international sports is actually more mutable and modern than it looks. As is the competition itself. Organizers determined to defuse sailing's snooty image and draw bigger crowds have, this time, reimagined everything—from broadcasting to boats. It takes guts to overhaul something so ancient. The technical challenge is precisely determine the exact position, orientation, and movement of the new high-tech racing catamarans, and then overlay that data along with computed distances and laylines to the marks on the race course onto video being shot from helicopters over the racecourse – in real time so it can be provided to broadcasters for live television coverage. The 34th America's Cup next year in San Francisco Bay will be raced in AC72s, a brand-new wingsailed, multihull boat. There hasn't been such a radical redesign in two decades, if ever. The 2013 match will also be the first that's truly visible, both physically (we'll be able to watch the whole race from land) and in spirit. They've decided to use technology to make real-time race decisions and competitor progress transparent to fans. "It's taken 160 years to reach some of these quite obvious conclusions," Russell Coutts, chief executive and helmsman of Oracle Racing, told me. "This industry was so secretive before." Now sailing is getting less opaque and more nimble, onboard and off. July 1 is the first day that Sweden, New Zealand, France, Italy, Korea and the defender of the cup, Oracle Team USA, are allowed to launch their 72-foot-long catamarans into the bay, to start practicing for next year—and these new cats can go 40 knots. That's almost 50 miles per hour. Meanwhile, convincingly, the LiveLine technology of the U.S. America's Cup team recently won an Emmy award "for extraordinary innovation in sports." 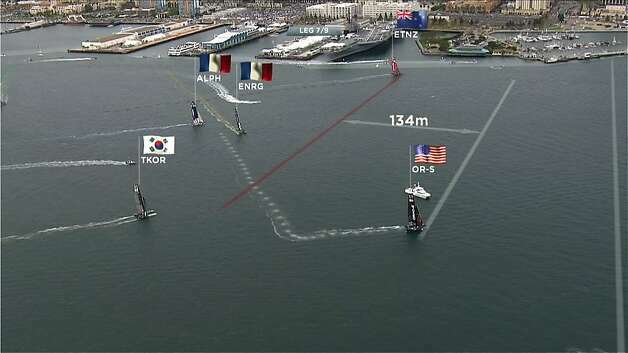 Superimposing geo-positioned graphics and data streams over live race video, LiveLine "paints" virtual boundary, finish and ahead-and-behind lines on the water during a broadcast. This live-televised technology was pioneered with hockey in 1996, to track the puck. Then came the yellow first-down line in football, the virtual strike zone in baseball and Nascar tracking. 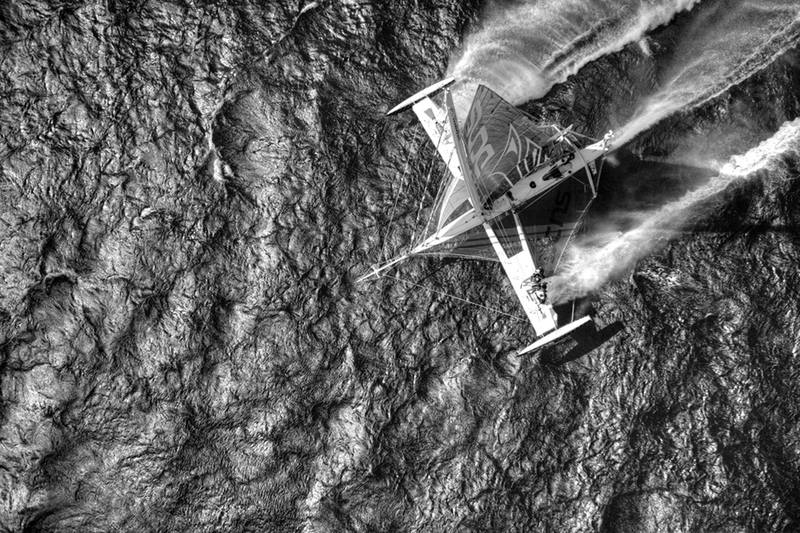 It's a bit trickier applied to sailing, with video shot from a moving helicopter. But LiveLine's GPS can still track the America's Cup boats to within 2 centimeters. LiveLine constantly adjusts for hue, too (water color fluctuates in a way AstroTurf does not), recognizing what is fluid and what isn't, to avoid "painting" a line over a boat or a buoy. "To a guy like Russell, he probably gets less out of LiveLine," says Stan Honey, director of technology for the America's Cup Event Authority, who developed the system. Great sportsmen already have a sixth sense for how close they are to the turn mark or out-of-bounds line: "They can't see it, but they know where it is." LiveLine is not for them. It's for us lay sailors and landlubbers, to give us a taste of that acute athletic instinct. The feeling that we could win. Making sailing more accessible is the right way to go—even if organizers are making a virtue out of necessity. Elitism, from sports to politics to education, doesn't sell any more. And, of course, sailing's reputation has been alternately pompous and perilous, sometimes both. Beyond the clichés, though, sailing teaches you not to overthink or oversail, but to adapt. Can the organizers actually do that? Rebrand not just a contest but a whole sport? Will they charm the international new guard, without alienating the old? I was at the black-tie 150th-anniversary party of the America's Cup, just a decade ago, at Queen Victoria's Osborne House. It was really fun, not revolutionary. Have things changed that much? Consider perhaps the riskiest innovation yet. The new boats are now dotted with high-quality microphones to transmit onboard race conversations to fans on land. And in next year's match finals and the World Series leading up to them (like this weekend's in Newport, R.I.), races will be streamed on YouTube and many televised by 19 broadcasters, including NBC (U.S.), Canal+ (France), and Star (U.K.). Live. So Oracle Team USA has instituted something really bold: a no-profanity policy for the entire outfit. Swear jars are now accepting both dollars and euros. "It's changed the culture relatively quickly," says Mr. Honey. And surely, if sailors can stop swearing like sailors, then anything is possible. After a month-long delivery trip aboard a cargo ship, which left Toulon in southern France on 28 May 2012, l’Hydroptère DCNS made it safely into port in Los Angeles this Tuesday 5 July 2012. The big carbon bird will be reassembled and relaunched in the Californian port of Long Beach, where she will be on weather stand-by for her Transpacific Record attempt. The Transpac, or Transpacific, is one of the oldest yacht races in the world, since it was created back in 1906. Every two years, for over a century, it has gathered together the greatest sailors on the planet, who come to do battle over the 2,215 nautical miles (4,102km), which separate Los Angeles from Honolulu, the capital of Hawaii. This legendary course also forms the backdrop for a number of record attempts throughout the year. To date, French sailor Olivier de Kersauson holds the transpacific record, which he set back in November 2005 at the helm of Geronimo, with a time of 4 days, 19 hours and 31 minutes, at an average speed of 19.17 knots (35.5km/hr on average). As such, it is this nearly seven-year old benchmark, that Alain Thébault and his four crew – Luc Alphand, Jean Le Cam, Yves Parlier and Jacques Vincent – will be attempting to erase aboard l’Hydroptère DCNS. The five sailors will initially position themselves in a ‘code red’ situation, as they await favourable conditions and prepare for the challenge on site. As soon as a propitious weather window presents itself, they’ll switch to a ‘code orange’, which is synonymous with a departure within the next 72 hours. Finally, if the weather window remains open, the ‘code green’ will be announced, with the crew readying themselves for a departure within the next 24 hours. Alain Thébault gives his view of the situation: "I’m particularly happy to be able to attack this Transpacific record. After the long months of preparation and work, it’s a fantastic reward for the whole team and all those who are supporting us. We’re now going to be able to show what l'Hydroptère DCNS is made of." Under the watchful eye of the inspectors from the WSSRC - the World Sailing Speed Record Council – who have to be on hand to approve the record, l’Hydroptère DCNS will then head out to the start line, which is situated offshore of the Point Fermin lighthouse, at the south-west tip of Los Angeles. The moment the flying boat crosses the start line, the crew will have 4 days, 19 hours and 31 minutes, to make the finish, which is directly in line with the Diamond Head lighthouse, in the famous Waikiki Bay. To ensure l’Hydroptère DCNS has every chance of success, a team of engineers from DCNS is in Los Angeles working on the servo-control system for the aft stabiliser and completing the optimisation with a view to setting off on the record attempt. This attempt is very much in keeping with l’Hydroptère DCNS’ offshore programme, whose aim is to demonstrate the offshore potential of ‘flying’ boats. Alain Thébault, her designer and skipper, has held the absolute speed sailing record over a nautical mile (an average speed of 50.17 knots or 95km/hr) since 2009 and eventually aims to develop a maxi-hydroptère capable of securing the greatest offshore records. As such the Transpacific Record is another important step along the way. In May 2010, peacock-hued swirls of blue and green in the North Atlantic contained tiny organisms, phytoplankton, that grow explosively in the North Atlantic—from Iceland to the shores of France—in the spring and summer. Scientists studying the annual growth of tiny plants in the North Atlantic Ocean have discovered that this year’s growth spurt began before the sun was able to offer the light needed to fuel the yearly phenomenon. The annual growth spurt of plankton, which is known as the North Atlantic Bloom, takes place each Spring, and results in an immense number of phytoplankton bursting into existence — first “greening,” then “whitening” the sea as one or more species take the place of others. In winter, cooling and strong winds generate mixing that pushes phytoplankton into deeper waters, robbing them of sunlight, but drawing up nutrients from depths. As winter turns to spring, days become longer. 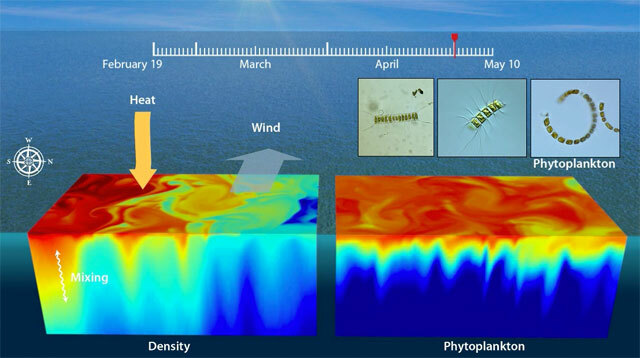 Phytoplankton are then exposed to more sunlight, fueling their growth. But this year’s discovery initially puzzled researchers, since for decades the phytoplankton have required the longer days and calmer seas of Spring to fuel their growth. 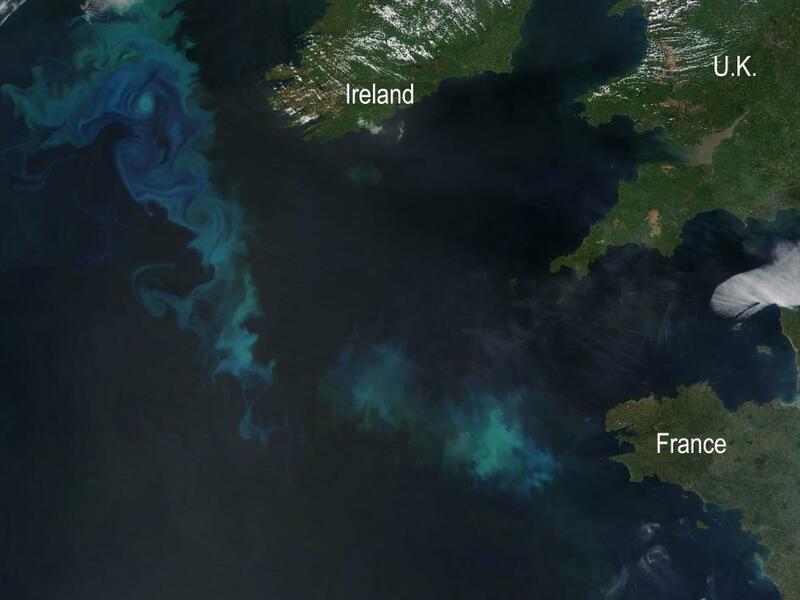 Plankton blooms in the North Atlantic in this photo taken in spring, 2012. However, the current study suggests evidence of another trigger. The researchers found that whirlpools, or eddies, that swirl across the North Atlantic sustain phytoplankton in the ocean’s shallower waters, where the plankton can get plenty of sunlight to fuel their growth even before the longer days of spring begin. The eddies form when heavier, colder water from the north slips under the lighter, warmer water from the south. The study revealed that the eddies cause the bloom to begin about three weeks earlier than would otherwise be the case if the growth was spurred only by the longer days of Spring. “That timing makes a significant difference if you think about the animals that eat the phytoplankton,” said Eric D’Asaro of the University of Washington (UW), one of the study’s co-authors. Many small sea animals spend the winter dozing in the deep ocean, emerging in the spring and summer to feed on the phytoplankton. “If they get the timing wrong, they’ll starve,” Craig Lee of UW’s Applied Physics Laboratory and School of Oceanography said. Since fish eat these tiny sea animals, any reduction in their number could harm the fish population. 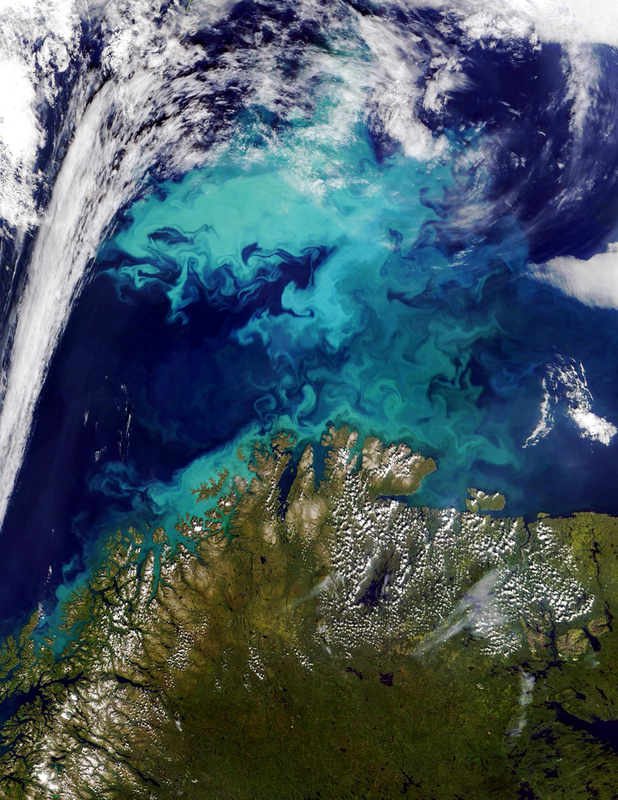 The North Atlantic Bloom is also important to the global carbon cycle, since Springtime blooms of microscopic plants in the ocean absorb enormous quantities of carbon dioxide, emitting oxygen via photosynthesis. Their growth contributes to the oceanic uptake of carbon dioxide, amounting globally to about one-third of the carbon dioxide we put into the air each year through the burning of fossil fuels. Indeed, the North Atlantic is critical to this process, and is responsible for more than 20 percent of the ocean’s uptake of CO2. “Our results show that, due to eddies, the bloom starts even before the sun begins to warm the ocean,” said Amala Mahadevan, an oceanographer at the Woods Hole Oceanographic Institution and lead author of a paper about the study published in the journal Science. “Every undergraduate who takes an introductory oceanography course learns about the ecological and climate significance of the North Atlantic Bloom – as well as what causes it,” said Don Rice, program director in National Science Foundation’s Division of Ocean Sciences, which funded the research. 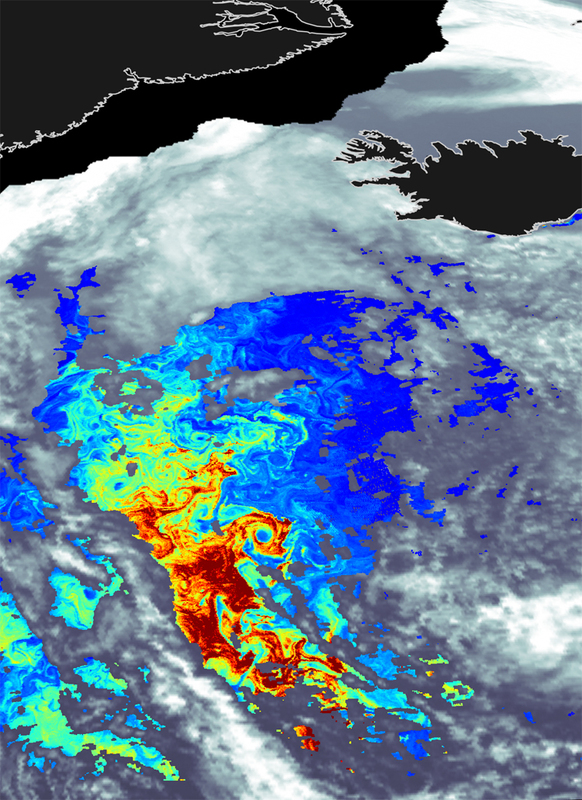 The satellite image, with eddies clearly visible, shows chlorophyll concentration in the North Atlantic during the spring phytoplankton bloom. Scientists have long known that widespread springtime blooms take up enormous quantities of carbon dioxide, creating organic matter and emitting oxygen. The North Atlantic is an especially crucial region, responsible for more than 20 percent of the entire ocean’s uptake of human-generated carbon dioxide. New understanding of the underlying physical mechanisms of the annual blooms allows them to be represented more accurately in global models of the oceanic carbon cycle and improves the models' predictive capability. The newly discovered mechanism helps explain the timing of the spring and summer bloom, known to mariners and fishermen for centuries and clearly visible in satellite images. It also offers a new look at why the bloom has a patchy appearance: it is shaped by the eddies that modulate its formation. But making the discovery was not without its challenges. “Working in the North Atlantic Ocean is challenging, but we were able to track a patch of seawater off Iceland and follow the progression of the bloom in a way that hadn’t been done before,” said study co-author Mary Jane Perry of the University of Maine. “Our field work was set up with floats, gliders and research ships that all worked tightly together,” said D’Asaro. The scientists focused on phytoplankton known as diatoms, which live in glass houses — walls made of silica. “When conditions are right, diatoms blooms spread across hundreds of miles of ocean, bringing life-sustaining food to sometimes barren waters,” said Lee. In April, 2008, Lee, Perry and colleagues arrived in a storm-lashed North Atlantic aboard the Icelandic research vessel Bjarni Saemundsson. They launched custom-designed robots in the rough seas, along with a float that hovered below the water’s surface to follow the motion of the sea. Lurking alongside the float were six-foot-long, teardrop-shaped gliders that dove to depths of up to 3,000 ft. After each dive, the gliders, working in areas up to 30 miles around the float, rose to the surface, pointed their antennas skyward and transmitted their stored data back to shore. The float and gliders measured the temperature, salinity and velocity of the water, and gathered information about the chemistry and biology of the bloom itself—oxygen, nitrate and the optical signatures of the phytoplankton. In total, scientists aboard two ships, the WHOI-operated research vessel Knorr and the Bjarni Saemundsson, visited the area four times. Soon after the measurements from the floats and gliders started coming in, the scientists perceived that the bloom had started even though surface conditions still looked winter-like. “It was apparent that some new mechanism, other than surface warming, was behind the bloom initiation,” said D’Asaro. Mahadevan used sophisticated three-dimensional computer modeling to analyze the information collected at sea by Perry, D’Asaro and Lee. She generated eddies in the model from a south-to-north variation of temperature in the ocean. Without these, the bloom happened several weeks later, and didn’t have the space and time structures observed in the North Atlantic. In the future, the scientists hope to put the North Atlantic bloom into a wider context. They believe much can be learned by following the phytoplankton’s evolution across an entire year, especially with gliders and floats outfitted with new sensors. The sensors would also look at the tiny animals that graze on the phytoplankton. Ocean physics, particularly what we are learning about eddies, is intrinsic to life in the ocean, the researchers said. 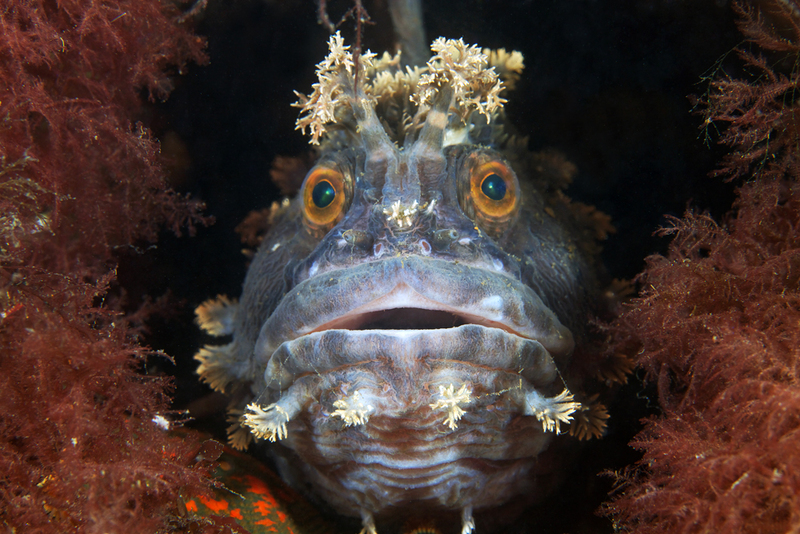 They shape the oceanic ecosystem in numerous ways. For instance, no phytoplankton means no zooplankton, and no zooplankton means no fish. Furthermore, eddies and phytoplankton play an important role in the oceanic cycling of carbon, without which we would have a different climate on Earth, the researchers noted. “We envision using the gliders and float to make measurements—and models—of ocean physics, chemistry and biology that span wide regions of the world ocean,” said D’Asaro. That would spark a new understanding of the sea, all from a tiny plankton that each spring and summer blooms by the millions and millions, Lee added. “What we’re learning about eddies is that they’re a critical part of life in the ocean,” said Perry. The debut music video from director Houmam Abdallah combines the real with the surreal as we follow a wandering boat into a world where art and nature merge. In the new video for "The Rip Tide," indie folk group Beirut present serene, mesmerizing scenery with a boat sailing on the sea. As singer-songwriter Zach Condon sings over beautifully layered orchestral arrangements, the little boat continues on its way, drifting along the wind and the currents. As the video approaches the end, gorgeous, ethereal clouds of crimson and blue envelop the sailboat, draping the ship in constantly changing colors. The clip soothes until the climax, taking the video's visual reality to magical heights. The new video for the title track of Beirut's current album, The Rip Tide was inspired by Salvador Dali, Georges Seurat and JMW Turner whose glorious use of light and colour is evoked in this nautical adventure.